You can freeze this quiche right after assembly. It doesn’t need to be pre-baked, and it doesn’t need to be thawed first when you are ready to bake. 2. Dock crust by perforating it with a fork at 1″ intervals over the bottom and sides. 3. Bake pie crust for 10 minutes. Remove from oven and immediately sprinkle with half the cheese. Lower oven to 375°. 4. Place the broccoli and 1 Tbsp water in a glass measuring cup, cover with plastic wrap, and microwave 3 minutes until crisp tender. Drain and set aside. 5. In a non-stick skillet, melt the butter and olive oil. Cook the onion and mushrooms until wilted. Add the garlic and cook about 2 minutes more. Remove from heat. Season to taste with salt and pepper. 6. 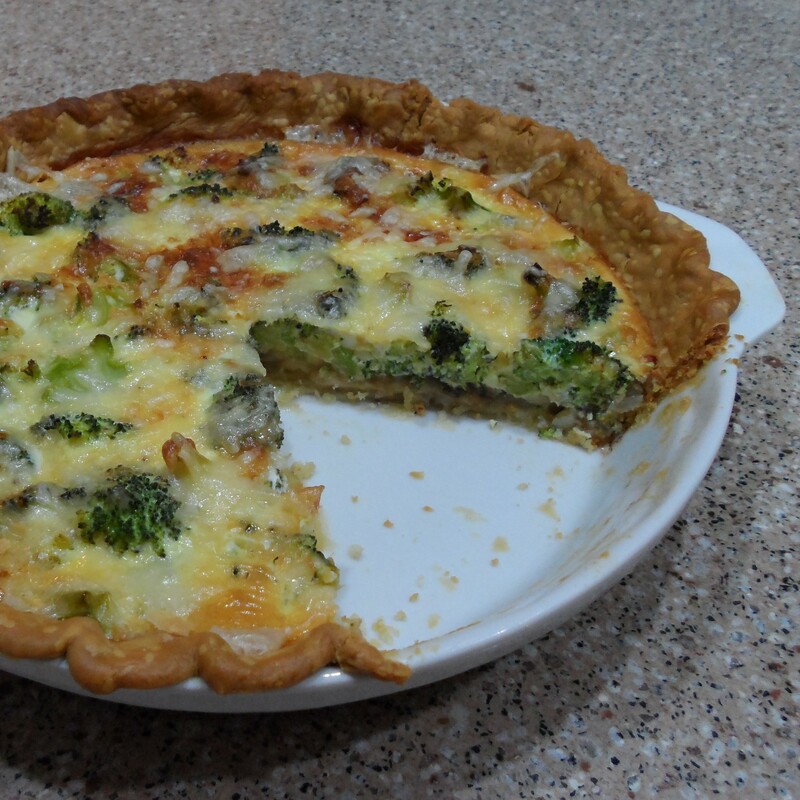 Spoon the mushroom mixture into the pie crust and top with the broccoli and half of the remaining cheese. 7. In a two cup glass measure combine the eggs and milk with a little more salt and pepper and pour gently over the broccoli and cheese. 8. Bake at 375* for 45 minutes, top with remaining cheese, and bake about 15 minutes more, or until a knife inserted near the center comes out clean. 9. Remove from oven and let stand 10 minutes before serving.